Mom and dad are still fighting... I think. The last time we discussed the drama (or lack thereof) between Kelly Ripa and Michael Strahan, the Live! hosts were busy complimenting each other on Ripa’s first day back in the studio since learning of Strahan’s upcoming departure. “This is entertainment, our job is to be entertaining,” she proclaimed before getting back to work like a true professional. But Friday morning, some four days after the two were done saying everything between them was fine, Ripa and Strahan had an exchange as uncomfortable as dinner with a married couple who casually mention each other’s many infidelities while dipping bread into olive oil. It all started when the hosts changed the topic to a new “trend” for divorced parents with joint custody in which they keep the kids in a single house, and take turns living in the house with them. 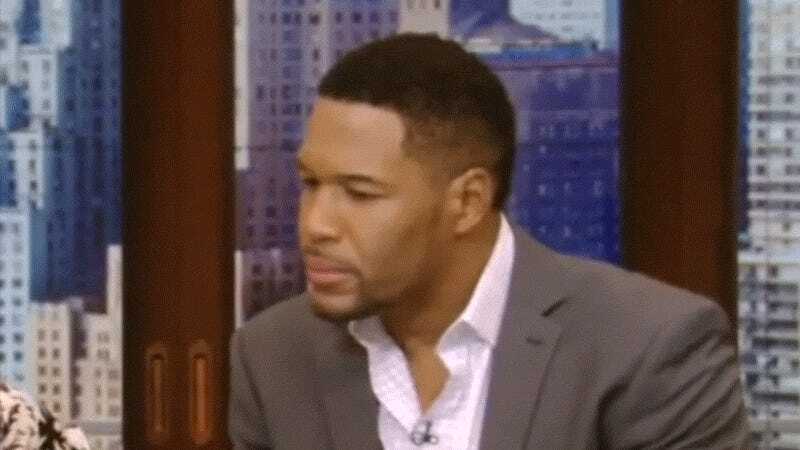 Ripa, who just celebrated her 20th wedding anniversary, claimed she didn’t understand how this would work, and asked Strahan for his thoughts, saying, “So, um, you’ve gotten divorced...” Strahan, who’s been divorced twice, then turned to the audience, pursed his lips, and quickly shook his head—his eyes widened from the shock of her comment. Ripa’s comment comes just one day after she freaked out when a screaming hairy armadillo projected something into her mouth during an animal segment on the program. “Our long national nightmare” may be over, but a very public feud appears to have just begun.